Downtown: Walking distance 4km (generally in Bus excursions). Terceira is one of the largest and more beautiful islands of the Azores. Originally called the island of Jesus Cristo, it was renamed Terceira (Third) due to the fact that it was the third island to be discovered in the Azores. Praia was the capital of the Azores until the mid-15th century and the historic center still has many colorful old houses as well as a couple of interesting churches. 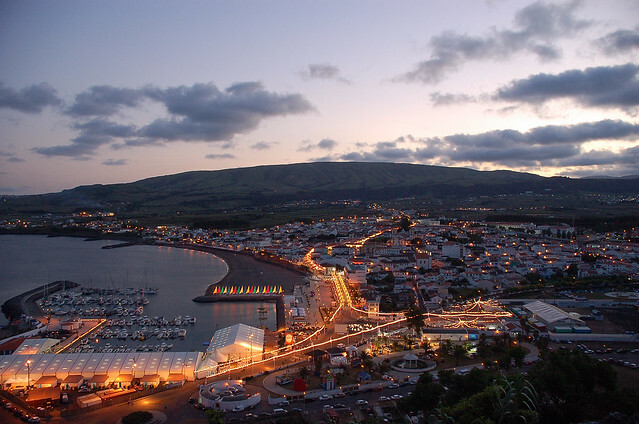 Terceira is the most populated island of the Central Group of the Azores archipelago, with an area of 382 sq.km (147 sq. miles) located 90 miles from São Miguel and 66 miles from Faial Originally Jesus Christ Island and populated from 1450. The town boasts two notable churches, several public squares, and a number of hotels and restaurants. It is popular with wind surfers because of the constant stiff sea breeze. It edges up against a low mountain ridge called Facho (Portuguese for Torch, because in its top a primitive lighthouse and lookout place against pirates, and later a marine and military semaphoric signal station, operated for about 400 years), and a large public park atop the ridge affords excellent views of the surrounding countryside and the Atlantic Ocean. The Port of Praia da Vitória is located at the Bay of Praia da Vitória, Terceira Island, Azores, Portugal, 20 Km away from the city of Angra do Heroísmo, which is classified as World Heritage by UNESCO.